Get ready for higher speeds on your BSNL 3G, the state run telecom operator which is already providing its subscribers with most competitive 3G tariffs will now soon be offering speeds of 14.4 Mbps to its 3G users. According to our sources 14.4 Mbps speed on BSNL 3G is already live in Trivandrum (Kerala), which is the first city where 14.4 Mbps speed was launched. Ahmedabad and Pune will get 14.4 Mbps on 3G by the end of January 2011. BSNL is planning to complete the roll out of 14.4 Mbps on 3G network of all the circles, and not only West Zone, by the end of first quarter of 2011. This upgrade willl surely earn BSNL a huge number of 3G subscribers at will not just offer 14.4Mbps speeds but will offer it at very competitive prices. So are you planning to migrate to BSNL 3G? Let us know. 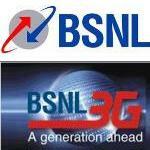 Update : BSNL plans to upgrade its network to provide speeds of upto 21.6 Mbps by the end of year 2011.